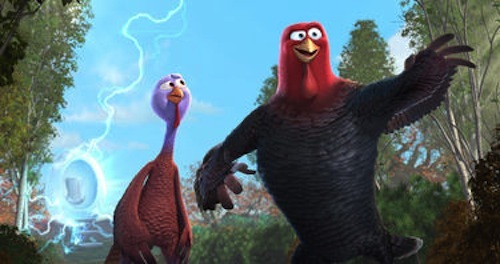 Synopsis: Two turkeys from opposite sides of the tracks must put aside their differences and team up to travel back in time to change the course of history – and get turkey off the Thanksgiving menu for good. If there was ever an animated movie vegetarian advocate groups were to promote, Free Birds is it without question. Now, there is still fun to be had by those who love meat, and turkey in particular, but what if Thanksgiving dinner did not include turkey? Or stuffing, mashed potatoes, nor green beans? Yes, things are beginning to sound crazy, and downright sacrilegious. It is happening in Free Birds, the story of two very different turkey’s given the opportunity to travel back in time to change the course of history by removing turkey, and all the trimmings, from the first Thanksgiving feast in 1621 between the Pilgrims and Indians. Whether this stopped the Small Pox epidemic is left untouched in the story, perhaps a sequel is already on the table? On a free-range farm lives a turkey named Reggie (voiced by Owen Wilson from The Internship), an outcast amongst the other turkeys. His difference is mainly due to an alternative appearance, he has a blue head, but also his intelligence level. Reggie is smart, and he has been warning his fellow turkeys that the farmer is only feeding them so he can slaughter them later for dinner. 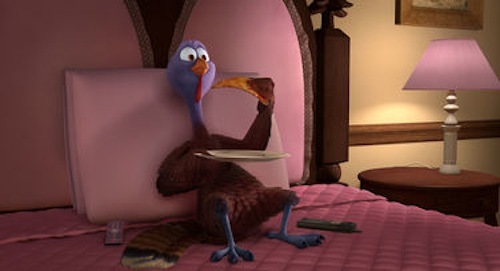 There is little subtlety in Free Birds, the movie comes right out and tells its viewer the fate of turkeys on a farm, and it even includes a shot of the farmer with his blade in hand, holding a turkey by its throat, as they walk off to the barn–said barn is what the turkeys call going to “turkey paradise.” Lesson learned, turkeys in the present are not smart. Amidst all of the dumb turkeys there is Reggie, and luck would have it that he is chosen, albeit not willingly and without knowing what is actually going to happen to him, to be the one turkey the President pardons for the current year’s Thanksgiving. With the pardoning comes great rewards: Reggie gets to live at Camp David, eat all the pizza he wants, and watch telenovela’s on a big comfy bed. Not a bad life for the outcast. 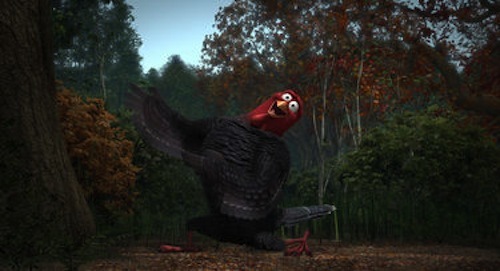 It’s too bad Jake (voiced by Woody Harrelson of Now You See Me), a wild naturally overgrown turkey, kidnaps him. You can call it a recruitment into the “TFF” (Turkey Freedom Front), as Jake does, but the line drawn is thin. The sole purpose of the TFF is to stop the use of turkey as Thanksgiving’s main course. How to do this? Time travel, of course. Jake’s hijacking of the government’s time travel device gets him and Reggie into a big mess, but they make it to 1621, a mere three days before the first Thanksgiving. In 1621 there are wild turkey’s everywhere, and one very big difference between them and those of the present–these turkey’s are smart, organized, and fighting for their lives. The Pilgrims were very hungry, and wild turkey was a delicious prospect for them. Can Jake and Reggie change history? Will Reggie find his place in the world? Is it really possible to have Thanksgiving without turkey? How would one sleep soundly if L-tryptophan was not consumed in high doses on this special U.S. holiday? All of the answers to the above questions are answered in Free Birds; except for the one about L-tryptophan, that is never mentioned, although it would have made for an interesting lesson in science and nutrition. While the entire idea of Free Birds is a bit preposterous, especially when the alternative to turkey is introduced and made out to be quite a shameful choice, seriously, and the backlash from nutrition-focused groups surely great, the movie itself is light and entertaining. It has laughter and fun scenarios with Reggie and Jake, and all of the other turkeys involved. The love story between Reggie and Jenny (Amy Poehler from “Parks and Recreation”) is perfectly executed, mostly because Poehler can deliver a line with sarcasm and flirtation mingled together without fault (even as an animated turkey). The action never drags, nor does the movie lose focus or veer away from its initial purpose. Why the turkeys of the past are dressed like Indians (Native Americans) is a conundrum, but having them be highly intelligent and not full of any pre-existing stereotypes actually makes it a good choice. Indians needs better representation on film, and its a tad shocking that the movie to do so is Free Birds–yes, this comment is clearly referencing The Lone Ranger. The heavy use of product placement is obnoxious, and its clear one company had a heavy hand in getting the movie made at all, but its forgivable (more so for a child, adults may have issue). All preposterous notions aside, Free Birds is downright entertaining, for children and adults. Screenwriters Jimmy Hayward (also the director) and Scott Mosier have plenty of experience behind the camera making movies. Hayward directed Horton Hears A Who! and Scott Mosier has produced many films, including A Band Called Death and Jersey Girl. Their writing style is indicative to keeping your eyes and ears occupied at all times by giving characters quirky attributes. The method works. Jake has a short-term memory issue, and his repeating of, or forgetting what he said a moment ago, is quite funny. Jenny had a fall as a baby turkey which left her with an eye issue that acts up when she is nervous. The outcome, hilarity at times when you see the eye do what it does (no spoiler here). They also managed to infuse with pop culture references that are familiar but not blatant rehashes of old jokes or comedy staples. The favorite will undoubtedly be Yoda Turkey…enough said. Free Birds is not hilarious, nor is it stale and unfunny. It has a good balance of humor and seriousness, and it does not need anything more.